This article is about the band. For the Ibsen play, see The Pretenders (play). For other uses, see Pretenders (disambiguation). Not to be confused with The Great Pretender or Great Pretenders. The Pretenders are an English-American rock band formed in Hereford, England, and Akron, Ohio, United States in March 1978. The original band consisted of initiator and main songwriter Chrissie Hynde (lead vocals, rhythm guitar), James Honeyman-Scott (lead guitar, backing vocals, keyboards), Pete Farndon (bass guitar, backing vocals), and Martin Chambers (drums, backing vocals, percussion). Following the drug-related deaths of Honeyman-Scott and Farndon, the band has experienced numerous subsequent personnel changes, with Hynde as the only consistent member, and Chambers returning after an absence of several years. Hynde launched a solo career in 2014 and the Pretenders were dormant as a band between 2012 and 2016. However, The Pretenders are once again active, having issued an album and toured in 2016. Hynde, originally from Akron, Ohio, moved to London in 1973, working at the weekly music paper NME and at Malcolm McLaren and Vivienne Westwood's clothes store. She was involved with early versions of the Clash and the Damned and played in short-lived bands such as Masters of the Backside (1976) and the Moors Murderers (1978 lineup). The Pretenders formed in 1978 after Dave Hill at Anchor Records heard some demos of Hynde's music. He arranged a rehearsal studio in Denmark Street, where a 3-piece band consisting of Hynde, Mal Hart on bass (he had played with Hynde and Steve Strange in the Moors Murderers), and Phil Taylor of Motörhead on drums played a selection of Hynde's original songs. Dave Hill was impressed and arranged a day at Studio 51 to record another demo. Although it was rough, he felt he had seen and heard enough "star potential" to suggest that Hynde form a more permanent band to record for his new label, Real Records. Hynde then formed a band composed of Pete Farndon on bass, James Honeyman-Scott on guitar, and Gerry Mcilduff replacing Jon Adkin on drums. This band, then without a name, recorded five tracks at Regents Park Studio in July 1978, including "Stop Your Sobbing". Shortly thereafter Gerry Mcilduff was replaced on drums by Martin Chambers and Hynde named the band "The Pretenders" after the Platters song "The Great Pretender" which was the favourite song of one of her former boyfriends. Their self-titled debut album was released in January 1980 and was a success in the United Kingdom and the United States both critically and commercially. (Pretenders was subsequently named one of the best albums of all time by VH1, No. 52, and Rolling Stone, No. 155.) The band played at the Heatwave festival during August 1980 near Toronto. During March 1981, the EP Extended Play was released, containing the UK and US success "Message of Love" and "Talk of the Town", "Porcelain", "Cuban Slide" and a live version of "Precious", recorded in Central Park. The second full-length album, Pretenders II, was released during August 1981. Pretenders II included the Extended Play singles, the MTV video success "Day After Day", and popular album-radio tracks "The Adultress", "Birds of Paradise", "Bad Boys Get Spanked", and "The English Roses". On 18 September 1981 the Pretenders were the musical guest on the US late night sketch comedy show Fridays. The band performed "The Adulteress", "Message of Love" and "Louie, Louie". Andy Kaufman was the guest host of the programme on that night. Farndon's drug abuse escalated and he was fired after a meeting between Hynde, Honeyman-Scott, and Chambers, on 14 June 1982. Two days later, on 16 June 1982, James Honeyman-Scott died of heart failure as a result of cocaine intolerance. Farndon was in the midst of forming a new band with former Clash drummer Topper Headon (who was also a heroin addict and left his band, unable to cope), when he was found dead on 14 April 1983 by his wife. After taking heroin and passing out, Farndon had drowned in his bathtub. That left the Pretenders with two living members. Hynde continued with the band. During July 1982, a caretaker team of Hynde, Chambers, Rockpile guitarist Billy Bremner, and Big Country bassist Tony Butler was assembled to record the single "Back on the Chain Gang". The song was released in October and became their biggest success in the US, staying at No. 5 for three consecutive weeks. The single's B-side, "My City Was Gone" has been (except brief period in the 90s) the theme music for The Rush Limbaugh Show since its inception. Hynde then set up a more permanent lineup for the band, keeping Chambers and adding Robbie McIntosh on guitar and Malcolm Foster on bass. "Middle of the Road" was this line-up's first single, released in the US in November 1983 and reaching the Top 20 there. The US B-side, "2000 Miles", was released as a single in the UK. The third Pretenders album, Learning to Crawl (featuring the new lineup with Foster and McIntosh), was released in January 1984. As well as the three recent singles, the album included a cover version of The Persuaders' "Thin Line Between Love and Hate", which featured Paul Carrack on keyboards. For the next bout of touring, Rupert Black joined the live band on keyboards. In July 1985, the band (including Black) played at Live Aid. Further upheavals followed. Soon after recording sessions for the next album began and one track had been completed, Hynde declared that Chambers was no longer playing well and dismissed him. Discouraged at the loss of his bandmate, Foster quit ("My whole argument was that Martin Chambers was the rhythm section of the Pretenders and it didn't really matter who was playing bass. So I just said I didn't want to be involved any more.") Hynde and McIntosh recorded the rest of the album in various sessions in New York and Stockholm with assorted session musicians, including Carlos Alomar, Bernie Worrell (P-Funk), and sometime Eurythmics bassist Chucho Merchan. Towards the end of the sessions, Hynde hired two of the guest players–bassist T.M. Stevens and ex-Haircut One Hundred drummer Blair Cunningham—as the new Pretenders rhythm section. The Get Close album was released in 1986; the disc included the Top 10 singles "Don't Get Me Wrong" from the movie "Gung Ho" (helped by a popular video homage to the television series The Avengers) and "Hymn to Her" a No. 8 success in the UK. In the US, both "Don't Get Me Wrong" and "My Baby" reached #1 on Billboards Mainstream Rock chart. Two new non-album songs, "If There Was a Man" and "Where Has Everybody Gone?" were released on the soundtrack of the Bond film The Living Daylights and were used instrumentally by John Barry in several scenes. For the Get Close tour, Bernie Worrell was added to the live lineup on keyboards, meaning that the band now featured three African-American musicians with a strong background in rhythm-and-blues, funk, and soul. To Hynde's dismay this drastically altered the band's sound from its New Wave rock roots, and she realised that she was now fronting a new band that was "not Pretenders". Part way into the tour, she took drastic action: Stevens and Worrell were both sacked, Malcolm Foster was reinstated on bass, and Rupert Black returned on keyboards. Following the end of the Get Close tour in 1987, McIntosh quit the Pretenders and was replaced by former Smiths guitarist Johnny Marr. The group continued touring, after which Foster went on to join Simple Minds while Cunningham returned to session work. Later in 1987, the compilation "Pretenders - The Singles" was released, featuring all fifteen UK and US singles from the last ten years; it even included Hynde's duet with UB40 on the cover of Sonny and Cher's "I Got You Babe." Marr appeared on the Pretenders early 1989 single "Windows of the World" b/w "1969" produced by Nick Lowe, who had produced the band's first single in 1978. For this single, the band now consisted of Hynde, Marr, bassist James Eller and drummer James "J.F.T." Hood. After arguments with Hynde, Marr quit, moving on to The The and taking Eller with him. Exhausted by the upheavals of recent years, the band went into a hiatus for most of 1989 and 1990. When the Pretenders returned, it would be essentially as a solo act. In 1990 Hynde hired session players (including one-time Pretenders Bremner and Cunningham and bassist John Mckenzie) and recorded a new Pretenders album, Packed! Hynde was the only person pictured anywhere on the album, and was the only official member of the band. In Canada, the lead single "Never Do That" was a Top 40 success, peaking at No. 26, but it fared less well elsewhere. By 1993, Hynde had teamed with ex-Katydids guitarist Adam Seymour to form a new version of Pretenders. The team of Hynde and Seymour then hired a number of session musicians to record Last of the Independents that year, including ex-Smiths bassist Andy Rourke, ex-Primitives bassist Andy Hobson, and former Pretender and drummer/writer/producer James Hood, previously with The Impossible Dreamers and Moodswings. But by the end of the album sessions (and for the subsequent tour) the official band line-up was Hynde, Seymour, Hobson, and returning drummer Martin Chambers. This line-up endured for over a decade with no changes. Several recordings as Pretenders occurred during 1993, including a cover version of Jimi Hendrix's "Bold As Love" for the tribute album Stone Free, and a cover of 10cc's "I'm Not In Love" for the film, Indecent Proposal. When Last of the Independents was released in 1994, it rated gold in the US. Lead single "Night In My Veins" was a minor success in the US, a mid-chart success in the UK, and a top 10 success in Canada. The second single was the album's centrepiece ballad "I'll Stand by You"; this track received substantial airplay, and was a top 10 success in the UK, and top 20 in the US (No. 16 on the Billboard Hot 100) and in Canada. Hynde wrote a good portion of the album with the team of Billy Steinberg and Tom Kelly. Subsequently, the band toured in small venues around the US, sometimes including a string quartet. Some of these arrangements are preserved on the 1995 The Isle of View live album and DVD, made at London's Jacob Street Studios. Damon Albarn played piano on the recording, which also featured the Duke String Quartet. During 1997, the Pretenders supplied two tracks for the soundtrack of the Ridley Scott film G. I. Jane: "Goodbye" and "The Homecoming". On 10 April 1999 Hynde led the memorial concert "Here, There and Everywhere – A Concert for Linda" for her late close friend Linda McCartney at the Royal Albert Hall, London, organised by Hynde and Carla Lane. Proceeds went to animal rights charities. Performing artists included the Pretenders, Elvis Costello, George Michael, Des'Ree, Heather Small, Neil Finn, Tom Jones, Lynden David Hall, Marianne Faithfull, Sinead O'Connor, Eddie Izzard, Ladysmith Black Mambazo and Sir Paul. The Pretenders were the backing band for all artists. Over the course of the decade, Hynde became increasingly concerned with political activism, vocally supporting the environmental movement and vegetarianism. Viva el Amor was released during 1999, as was their collaboration with Tom Jones on the album Reload. The Pretenders joined with Emmylou Harris on Return of the Grievous Angel: A Tribute to Gram Parsons, performing the song "She". A Greatest Hits compilation followed in 2000. During 2002 Loose Screw was released by Artemis Records, the first Pretenders record to be released by a company other than WEA. Rolling Stone noted its "refinement, stylish melodies and vocal fireworks," while Blender called it "slick, snarky pop with flashes of brilliance". "I know that the Pretenders have looked like a tribute band for the last 20 years. ... And we're paying tribute to James Honeyman-Scott and Pete Farndon, without whom we wouldn't be here. And on the other hand, without us, they might have been here, but that's the way it works in rock 'n' roll." After their Hall of Fame induction, the Pretenders continued touring as a four-part team (Hynde, Seymour, Hobson, and Chambers). During 2005, bassist Hobson left and was replaced by Nick Wilkinson, marking the band's first line-up change in thirteen years. That same year, Rhino Records released the four disc and DVD box set Pirate Radio 1979–2005, which spanned the group's entire career. Two disc remastered versions of the first two albums also came out that year with bonus tracks. During 2007, Rhino remastered both Learning To Crawl and Get Close once again, with bonus tracks. Not long after, guitarist Seymour left and was replaced by James Walbourne. The Pretenders' album Break Up the Concrete was released through Shangri-La Music on 7 October 2008. It was the band's first Top 40 album in the US in twenty-two years, and its last to date. Tracks include "Boots of Chinese Plastic", "Don't Cut Your Hair", "Love's a Mystery", "The Last Ride" and "Almost Perfect". With Hynde was the guitarist James Walbourne, pedal steel player Eric Heywood, bassist Nick Wilkinson, and drummer Jim Keltner (on the album only). Chambers returned to the drums on tour with the band. Several one-off shows were performed during the closing months of 2008, including a couple of Christmas charity shows. The 'Break Up The Concrete Tour' began in mid-January and covered most of the United States, with shows until the end of March. It then continued in Europe, with gigs in Sweden, Norway, Finland, Denmark, Germany, the Netherlands, France, Spain, Belgium, and the UK during June and July, before returning for a new tour in Canada and the US during August and September 2009. A show from the tour, filmed at Shepherd's Bush Empire in London on 15 July 2009, was released on CD with bonus DVD / Blu-ray on 9 February 2010, titled Pretenders: Live in London. Another tour was announced in May, a double headlining tour in New Zealand and Australia with Blondie for a few capital city and winery shows. On 5 February 2011, Hynde and the Pretenders performed live on CMT Crossroads CMT Crossroads with Faith Hill and her band, including songs from both catalogs. 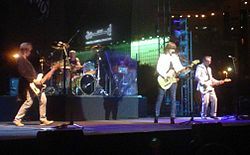 In September 2012, the Pretenders re-grouped (Hynde, Chambers, Heywood, Walbourne, Wilkinson) as part of the entertainment line-up for the 2012 Singapore Grand Prix. They were joined by keyboardist/acoustic guitarist Carwyn Ellis in autumn 2012. The Pretenders did not play live between 2012 and 2016. Hynde issued her first solo album Stockholm in 2014. On 6 September 2016 Stevie Nicks announced that the Pretenders would tour with her on a 27 city tour for the last three months of 2016. The live band consisted of Hynde, Chambers, Heywood, Walbourne, Wilkinson, as before. The Pretenders released their new album, Alone, on 21 October 2016. However, Hynde was the only Pretender on the album, which was otherwise played entirely by session musicians. In May 2017, Ellis resumed touring with the Pretenders who toured Australia and New Zealand with Nicks. In October 2017, the Pretenders appeared on Austin City Limits. In 2018 the Pretenders played in several concerts during the South American leg tour of Phil Collins "Not dead yet tour". They started their 2018 Tour on June 23rd, 2018 at the Arroyo Seco Festival in Pasadena, CA, USA followed by 18 US shows. Then they will be off to the UK on August 3rd when they will play at Millennium Square in Leeds followed by 16 more UK shows ending with Slessor Gardens in Dundee on September 9th. ^ a b Lyndsey Havens (6 September 2016). "Stevie Nicks Announces Joint Tour with The Pretenders". Billboard. Retrieved 12 September 2016. ^ a b c d e f g h i j k l m n o p Strong, Martin C. (2000). The Great Rock Discography (5th ed.). Edinburgh: Mojo Books. pp. 767–769. ISBN 1-84195-017-3. ^ Peter Buckley, The Rough Guide to Rock. Rough Guides. 2003. p. 813. ISBN 1-84353-105-4. Retrieved 8 November 2009. ^ Miles, The Pretenders by Miles. Omnibus Press. 1980. p. 20. ISBN 0-86001-802-4. ^ Deanna R. Adams, Rock 'n' roll and the Cleveland connection. Kent State University Press. 2002. p. 396. ISBN 0-87338-691-4. Retrieved 8 November 2009. ^ Hynde, Chrissie (2015). Reckless. Ebury Press. p. 242. ISBN 9781785031441. ^ "Superfan Tig Notaro Interviews Chrissie Hynde About Her 'F--- Off' Attitude, Aging and Regret: Exclusive". Billboard.com. Retrieved 25 June 2016. ^ "Pretender to the Throne". Billboard Magazine. 29 May 2004. p. 65. Retrieved 9 June 2014. ^ "Critic Reviews for Loose Screw". Metacritic. 12 November 2002. Retrieved 19 April 2014. ^ "Neil Young News: Pretenders Inducted into Rock and Roll Hall of Fame by Neil Young". Thrasherswheat.org. 15 March 2005. Retrieved 19 April 2014. ^ "2014 Off Track Entertainment highlights". Singaporegp.sg. Retrieved 19 April 2014. ^ http://www.washingtontimes.com, The Washington Times. "CONCERT REVIEW: Stevie Nicks and Chrissie Hynde inspire fans at Verizon Center". washingtontimes.com. Retrieved 9 April 2017. ^ "ACL's Season 43 welcomes legendary rock band The Pretenders on Austin City Limits". Austin City Limits. Retrieved 16 March 2019. ^ "Pretenders 2018 Tour". Retrieved 6 July 2018. This page was last edited on 21 April 2019, at 08:16 (UTC).